The NuMotion NLC Expo in Houston. The Travis Medical conference in Georgetown, TX with Michelle Lange teaching a class on Dynamic Seating. The NSM sponsored class in Oklahoma City where Michelle Lange and Ginny Paleg each taught classes. The International Seating Symposium (ISS) in Vancouver, British Columbia where Michelle Lange and Jessica Pedersen taught a class on Dynamic Seating. The National Seating and Mobility, NSM Seating Symposium in Orlando. Seating Dynamics was as busy as ever during the show season this year. This show season took members of our staff out of the office for 56 days with about 7,500 miles driving and another 10,000 miles flying. This was definitely the busiest show season we have had and the most worthwhile ever. The NSM and NuMotion shows are private events with only their employees attending, and both showed a strong growing interest in dynamic seating. This year ISS was three days of classes and exhibits with record attendance of over 1000 people representing 23 countries and was the most effective as I can recall in a very long time. Awareness of the needs for, and the benefits of movement in dynamic seating has grown tremendously over the last few years. This year there were four different sessions and classes that presented on or discussed dynamic seating (including a half-day pre-symposium course). Based on the quality and quantity of our booth traffic, it was obvious that awareness and knowledge have been elevated considerably. I believe that we are just beginning to address this educational need. 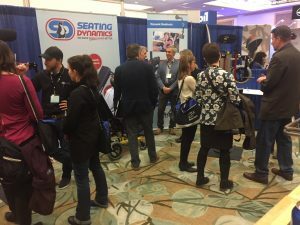 After more than a dozen years of talking about dynamic seating, people still come to the booth who are not familiar with our Dynamic Rocker Back Interface (DRBI), that has been available since 2006. The Dynamic Footrests and Dynamic Head Support Hardware are understandably lesser known as they are newer. Our Dynamic Head Support Hardware and the Dynamic Suspension System (DSS) received a great deal of interest. The DSS appears to be a product that people have been silently waiting for. We will continue to focus on educating the world on the needs and benefits of movement through our website, email, blogs and social media. It’s nice to be joined by the likes of Toyota who say, “When we are free to move, anything is possible”. Our message is about dependent mobility and there is emerging truth that movement within a wheelchair seating system can improve quality of health and life. We are all moving long before birth and we need to be moving. In the almost forty years I have been in this industry, it is nice to see old beliefs torn down and replaced with current thinking. We are dynamic beings, who are not meant to sit at 90/90/90. We need to move, and we need to keep changing. As our educational efforts grow, our international exposure is also growing. We have begun to make it easier for our friends outside the United States to gain access to our products. The interest and effectiveness that we saw in our travels this year is gratifying, confirms we are doing the right thing and that we have just started. ISS 2018 was wonderful! And whenever I stopped by the Seating Dynamics booth, things were hopping! It is so excited to see the interest in Dynamic Seating! FAQ: Can Dynamic Seating Be Used on any Wheelchair? What is Dynamic Seating? A definition. Who Can Benefit from Dynamic Seating? Maintaining Head Support Position – let’s do the math! The Dynamic Rocker Back Interface: when should I lock it out? Will my client break the Dynamic Seating? Oil and Water – Do Molded Backs and Dynamic Seating Mix? How Much is too Much? Choosing Resistance. FAQ: Can Dynamic Seating be used on a Power Wheelchair? Yes! Let’s Talk Compatibility. FAQ: Can Dynamic Seating be used on a Power Wheelchair? Yes! But when is it appropriate?